Ansgar and Rimbert, ninth-century bishops and missionaries to Denmark and Sweden, are fixtures of medieval ecclesiastical history. Rare is the survey that does not pause to mention their work among the pagan peoples of the North and their foundation of an archdiocese centered at Hamburg and Bremen. But Ansgar and Rimbert were also clever forgers who wove a complex tapestry of myths and half-truths about themselves and their mission. They worked with the tacit approval-if not the outright cooperation-of kings and popes to craft a fictional account of Ansgar's life and work. The true story, very different from that found in our history books, has never been told: Ansgar did not found any archdiocese at all. 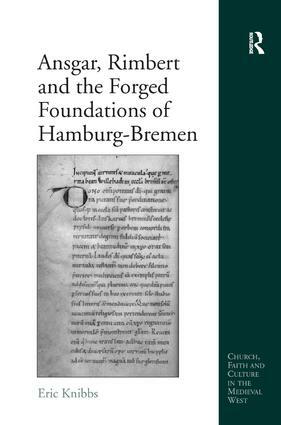 Rather, the idea of Hamburg-Bremen only took root in the tenth century, and royal sponsorship of the mission to Denmark and Sweden ended with the death of Louis the Pious. This book couples detailed philological and diplomatic analysis with broader historical contextualization to overturn the consensus view on the basic reliability of the foundation documents and Rimbert's Vita Anskarii. By revising our understanding of Carolingian northeastern expansion after Charlemagne, it provides new insight into the political and ecclesiastical history of early medieval Europe. Eric Knibbs is Assistant Professor of History at Williams College.